Pre-bake your crusts for 12-15 minutes, until the edges have browned. Over medium heat, sauté the onion, honey, and salt in 1 tablespoon of olive oil. Stir occasionally for about 10 minutes, until onions have softened. Add the remaining olive oil, then add the squash to the pan and continue to cook for 5-7 minutes, until vegetables are cooked through. Add the spinach, and cook for 2 minutes until the spinach has slightly wilted. 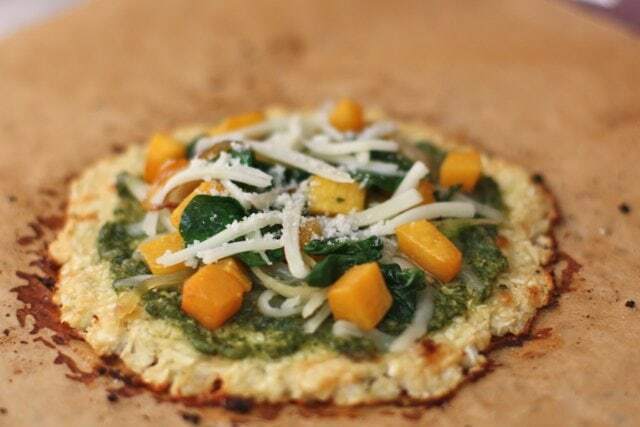 Spoon the pesto sauce onto the crusts, then layer with the vegetable mix and finish with the cheese. Sprinkle each pizza with 1 teaspoon pine nuts. Place under the broiler for 2-3 minutes, until cheese has melted.